Is a Declaration of Internet Freedom What the Internet Needs? 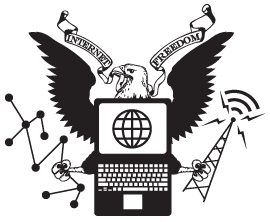 On July 4, a group of digital rights and other advocacy organizations unleashed a set of rights and principles for the Internet dubbed the Declaration of Internet Freedom. Amongst its initial signatories were organizations such as Free Press, Access, the Center for Democracy and Technology, and the Electronic Frontier Foundation, as well as Global Voices Advocacy. Also included in the initial list of individual signers were several Global Voices authors, as well as co-founder Rebecca MacKinnon. Individuals and organizations are encouraged to sign the document or participate through the efforts of other organizations listed on the site. The Declaration has garnered more than 1,300 signatures thus far and continues to gain momentum. Can we live without the Internet? Definitely! Should we? No. Whereas now we can’t live for a couple of hours without being connected, we spent all the war years trying to forget telephones existed. The fax was the great novelty that we could only contemplate because there were no telephone lines! I am a firm believer and defender of a free and open Internet as a Human Right as well as free WiFi. Do Not Censor the Internet. But what is censorship? I hate to get pedantic about things involving the internet — it’s the internet, not a Ken Burns documentary — but defining your terms is crucially important when you are trying to advocate for “freedom” of any kind. It’s all well and good to walk around saying “give us free” if you are in chains, but freedom means different things to different people. I’d like to be “free” to make money off the internet, for instance. Can I still be part of the “we”? The fact that so many different people use the internet for so many different purposes is exactly why we struggle to come up with broad-based consensus on how the internet should be regulated (if at all) in the first place. Defining the “we” is half the battle! “WE” are Americans. “THEY” are followers of a inbred crazy person with a fancy hat. Let’s play our game. Arguably, the lesson of the years since [John Perry Barlow’s Declaration of the Independence of Cyberspace] is that “the wider Internet community” does have something to fear from governments and other powers-that-be — thus the need for this new Declaration of Internet Freedom. Governments didn’t really stay away from the Internet when Barlow told them to do so. To be useful, does a document like this new one need to figure out where its authority comes from and what it means to do about enforcing its principles? After saying goodbye to Great Britain, the United States decided upon a geography-based winnowing into local and national representative legislatures. Certainly, there are other ways to do it. But defining representativeness is one way to avoid the swapping of one kind of tyranny for another. And it’s probably fair to say that harnessing representativeness and authority is something online politics hasn’t really figured out yet. In theory, nearly everyone can participate. How you judge that participation, though, is something that everything from Change.org to Americans Elect to folks who try to email Congress need to wrestle with.